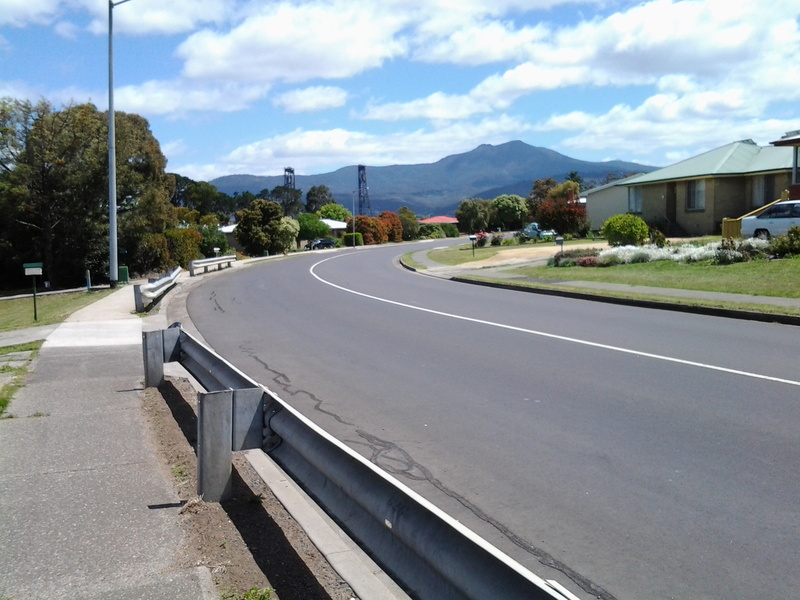 After Green Point and looking southwards, I could see Mount Direction in the distance (overlooking the Bowen Bridge – which I could not see). 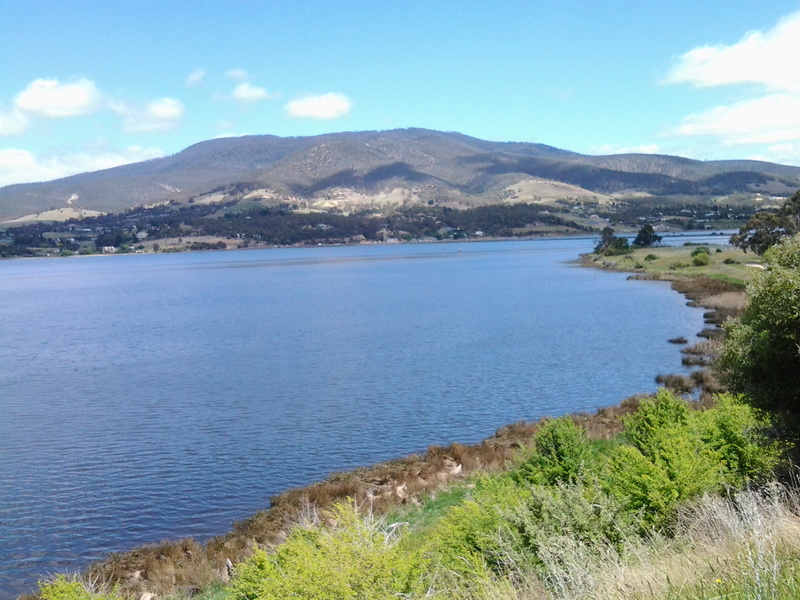 In the photo below, the swell of land on the right of the Derwent River is the foothills of Mount Wellington. 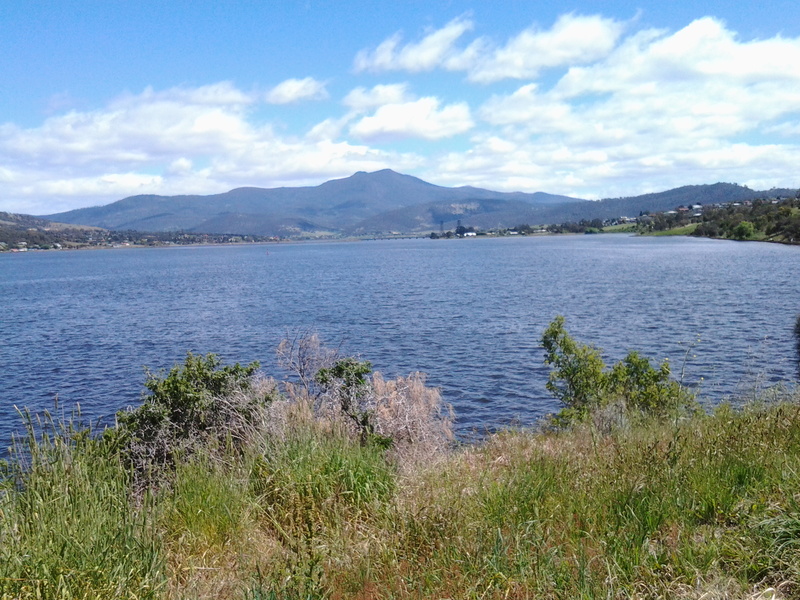 Early, on this leg of the walk, I stopped and looked northwards along the Derwent River. 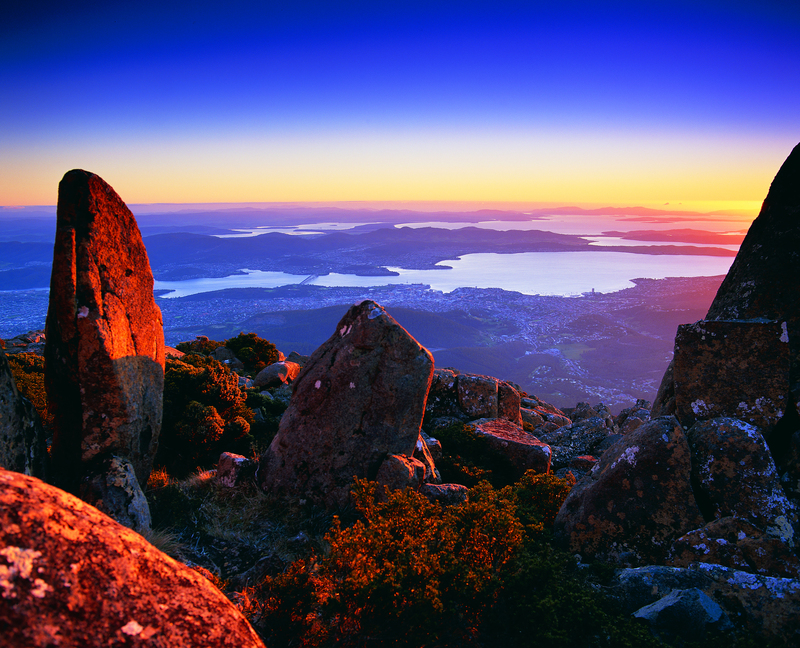 In the distance Mount Dromedary peered over the landscape. The early highlight of this part of the walk was seeing a collective of about 3 dozen plovers together. I don’t think I have ever seen such a group. The plovers were mostly standing around although some were walking around on an open mowed park area near a cluster of gum trees. Perhaps some were older ‘young’ plovers because from a distance they all looked the same size, give or take a bit. This seemed so unusual because I am only familiar with the two parents hanging about and guarding their one or two baby birds. In some paddocks, in the past, I have seen a number of pairs of parents but the pairs don’t hang out together and keep their own territory quite some distance from each other. 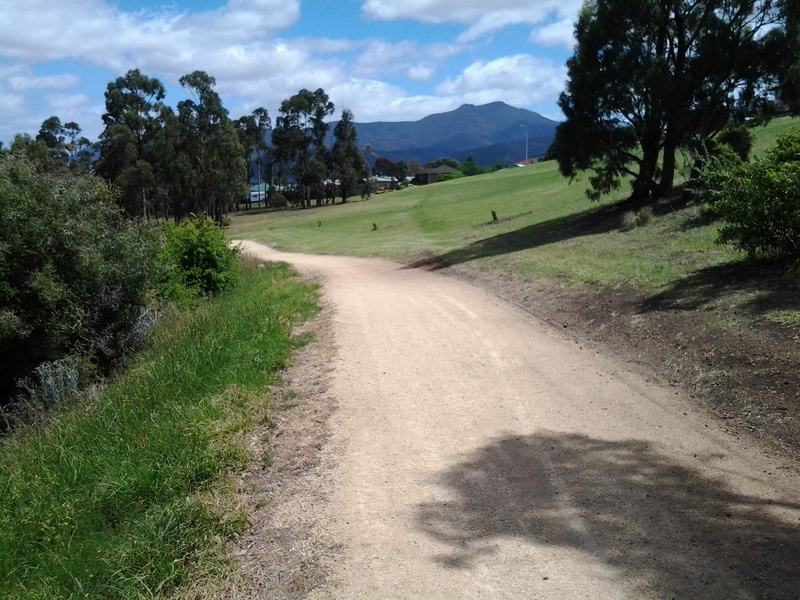 How pleasant this walk was. Consider the sublime calmness represented in the photo below. Around 12.45pm I stopped and sat on a bench seat with a view and watched what amounted to a natural cygnet farm. Dozens of cygnets about the size of a small duck were on the water close to shore. Only one adult black swan seemed to be on supervision duty. 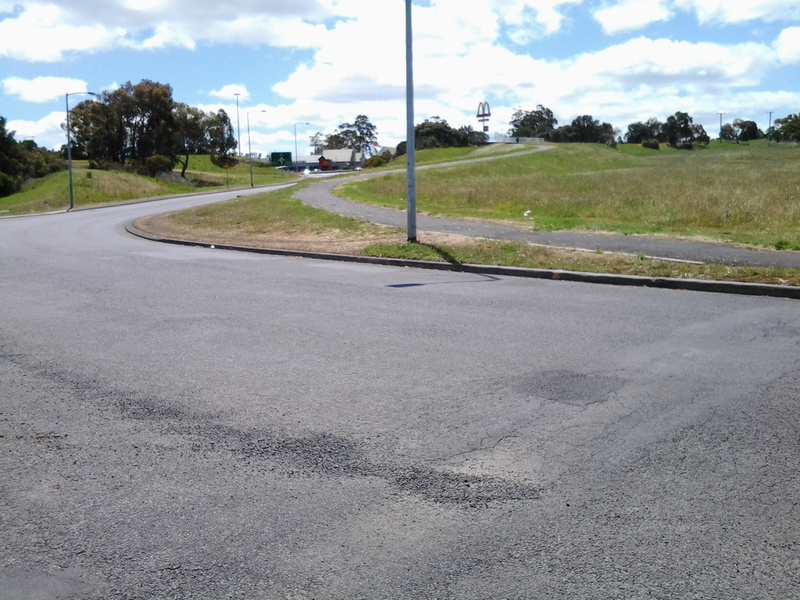 I wondered if the swan bureaucracy had been suffering major cutbacks of ‘staff’ like our Australian and State public agencies where services are meant to continue with less staff. 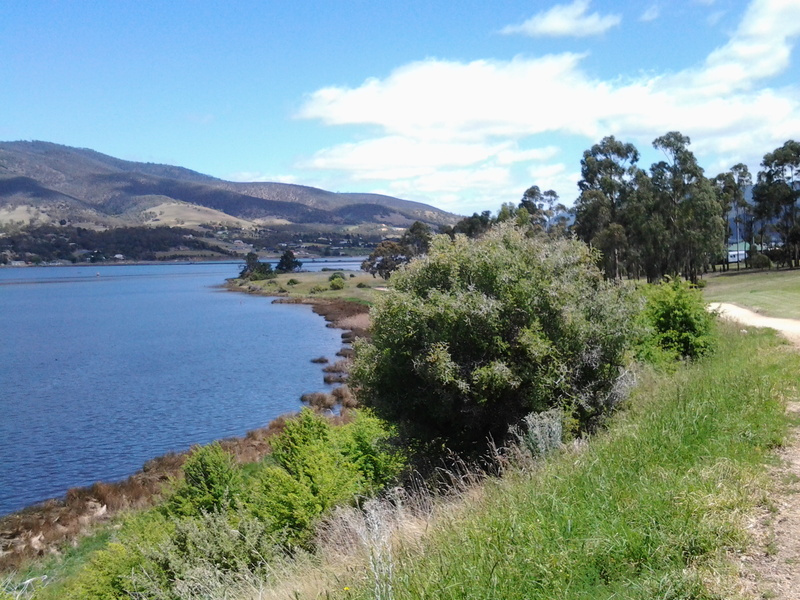 Opposite where I sat the Mount Faulkner Conservation Area was the main feature on the western shore of the Derwent River. At 12.56pm I reached Woods Point, sat under a shelter structure and consulted my maps. 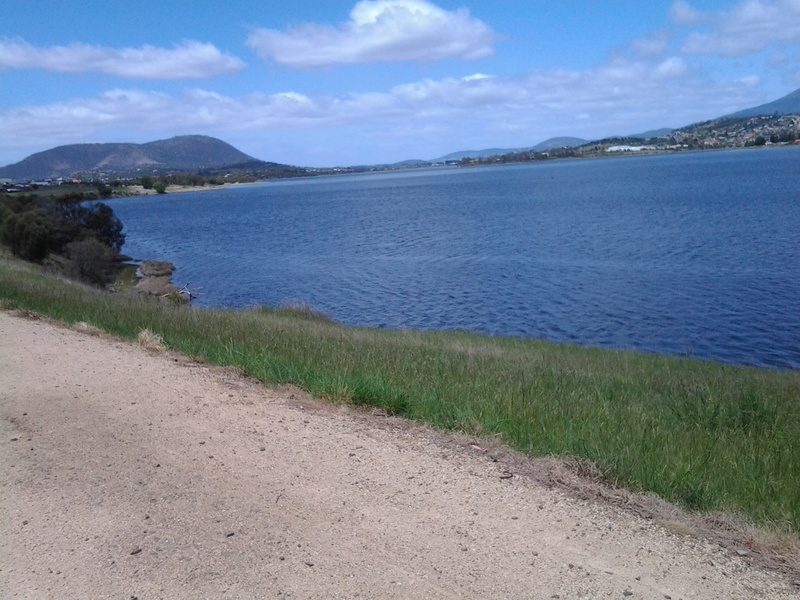 Five minutes later I left this Point and began walking north along Gunn St all the while having a good look at Mount Dromedary rising on the eastern shore but away in the distance north of Bridgewater. 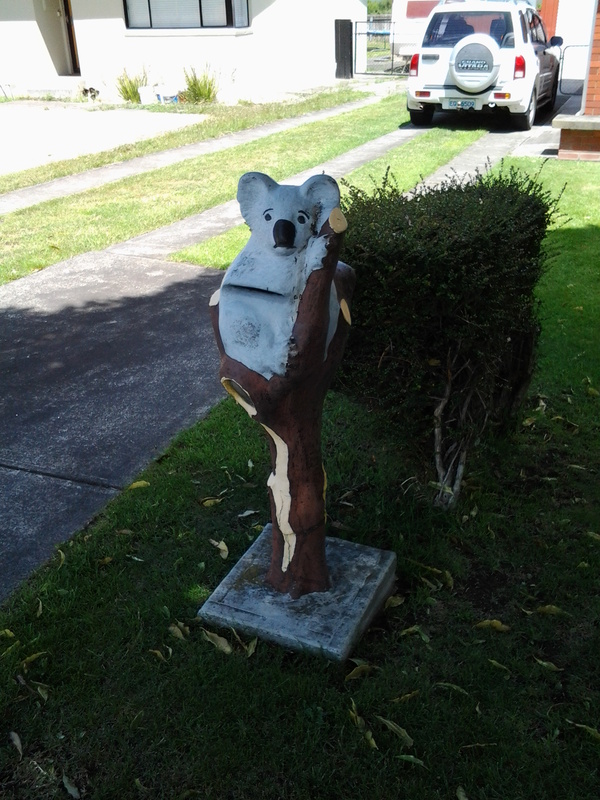 I was walking through suburban streets when a letterbox, under the shade of a tree, captured my attention. A poor sad concrete koala (maybe commiserating with the live koalas in Brisbane given to G20 leaders for a cuddle)! 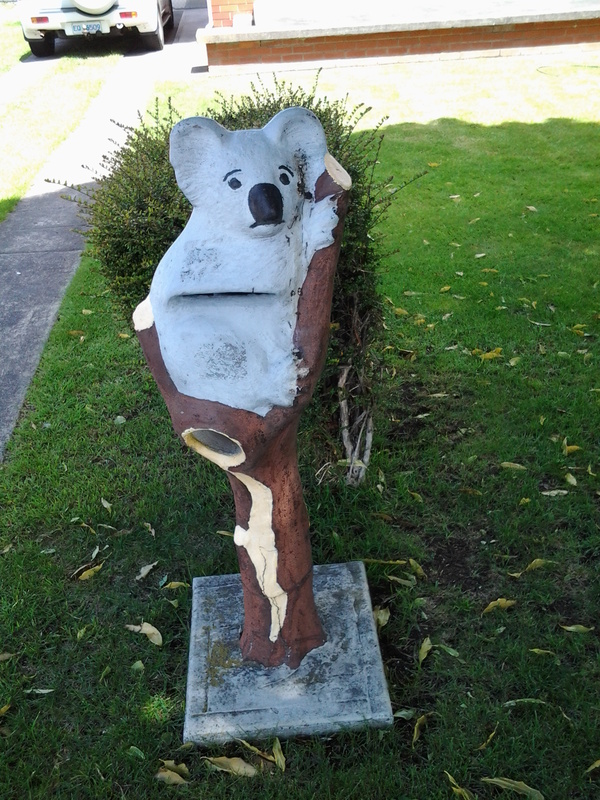 The postman would push his letters into a slit in the koala’s stomach. I also had a larger view of part of two uprights of the Bridgewater Bridge. I seemed so close. My day’s goal to nearly reach the Bridge had to be superseded. I was compelled to reach the Bridge and kept on walking, even passing bus stops. When I could see the golden arches of McDonalds at the end of the right hand road I veered left and headed for the Bridge nearby. 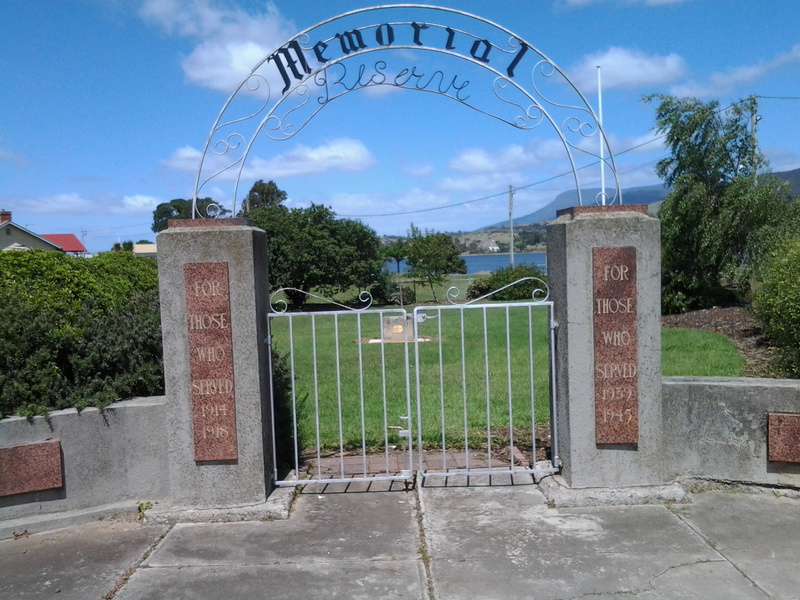 I stopped to photograph the semi-ornate gates of Memorial Reserve commemorating locals who died in various overseas wars (after all, this walk was occurring on the 11th November, Australia’s official Remembrance Day). Then I was at the Bridgewater Bridge. Now it wasn’t enough for me to reach the Bridge: I felt compelled to walk across it rather than waiting to do so in the next stage of the walk. 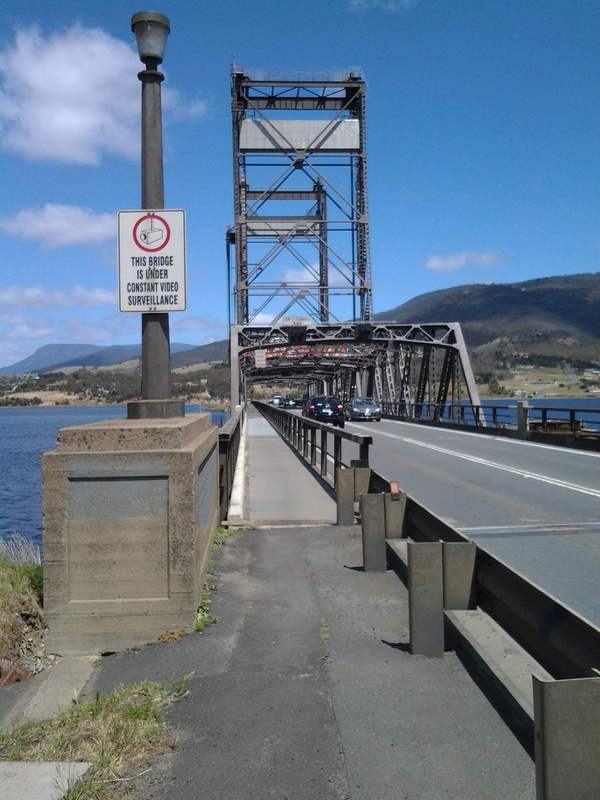 This entry was posted in Derwent River, Hobart, Mount Wellington, Walking and tagged Bowen Bridge, Bridgewater, Bridgewater Bridge, cygnet, G20, Green Point, koala, McDonalds, Memorial Reserve, Mount Direction, Mount Dromedary, Mount Faulkner Conservation Area, Plovers, Woods Point on November 17, 2014 by Tasmanian traveller.